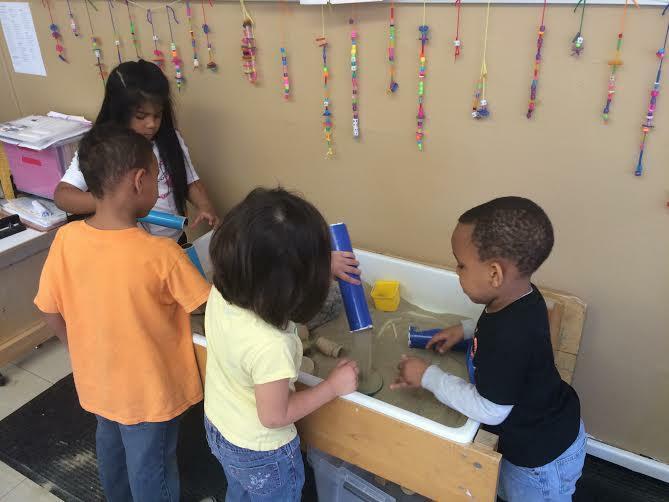 Students at Growing Futures, a Head Start preschool in Shawnee Mission. Thirteen years later, Van Zandt-Travis is the executive director of that preschool, Growing Futures. It's a federally-funded Head Start program and it's location might surprise you. "This is in affluent, beautiful Johnson County," says Van Zandt-Travis. "There are children and there are families that are struggling." In fact, there are more families struggling than ever in Johnson County. The poverty rate has nearly doubled since 2000, and over 25 percent of Johnson County students receive free and reduced lunch, up from 12 percent a decade ago. That doesn't quite mesh with Johnson County's reputation as the economic engine of eastern Kansas. Or, as Dustin Hardison puts it, "the old adage that the sidewalks are paved in gold in Johnson County." Hardison works for Catholic Charities of Northeast Kansas and he says that's just not the case anymore — the recession hit Johnson County hard. Many middle class families experienced poverty for the first time, while lower-income families fell even further behind. And recovery has been slow. "If a family is living in Johnson County and they have an emergency, say they were upside on their mortgage and now they downsized, they're still trying to recover from things that happened to them six years ago," says Hardison. In Johnson County, people living below the poverty line tend to be white, college-educated and working at least one job. Hardison says it could be your neighbor, or the person sitting next to you at work. "The face of poverty is no longer the stereotypical sleeping on the park bench," says Hardison. "It's more of people being doubled up in housing because they're trying to afford a place." That's poverty in Johnson County — a family that is doing fine until an unexpected medical bill or car repair. Data from the United Community Services of Johnson County says most of those people are out of poverty within two years. But it can be hard to stay afloat in a place where the cost of living is so high. The federal poverty level for one person is $11,700 a year, or $975 a month. The median rent in Johnson County is $932 a month, before utilities. "That can make up almost 75 percent of what you're taking home on a monthly basis," says Valorie Carson of the United Community Services of Johnson County. "So obviously, when you're that cost burdened, you really get into a situation where you can't stably meet all your basic needs on a regular basis." So why would you choose to live in Johnson County if you're struggling? "Because this is home," says Carson. "This is likely where they grew up. It's not people who are moving here from someplace else. It's people who live here and have lived here." Across the county line, Wyandotte residents feel the same way about their home, despite the county's high levels of poverty. Susila Jones, director of social services agency Cross-Lines, says that Wyandotte had been dealing with a more chronic form of poverty long before the recession hit. "We work with a lot of families [whose] entire family has known nothing except poverty," says Jones. Jones says the larger low-income population can translate to more support. "Because there are a higher concentration of families and individuals experiencing poverty, we definitely have a higher concentration of agencies," says Jones. "We are a bit more adept at referring people to resources in the community." But low cost of living and high density of services isn't enough. Although just a quarter of the size of Johnson County, Wyandotte County has a much higher homeless population, just one measure of the county's chronic problem. It's difficult to compare two such different counties. And whether it's a new phenomenon, like in Johnson County, or old news in Wyandotte, the fact is, families are struggling. Like Tony England and his wife. They've lived in Johnson County their whole life. They like the safe neighborhoods and good schools. But England has faced layoff after layoff since the recession and his wife is on disability. They're struggling to make ends meet and now come to the community dinners at Center of Grace church in Olathe for free meals. "It's just a matter of really living paycheck to paycheck and trying to get by in the area with the way expenses are," says England. "If it weren't for these meals, we'd probably be hungry a couple of days a week." With state budget cuts, local providers say it isn't about Wyandotte or Johnson — they're going to have to work together to serve a growing community of need on both sides of the county line. This look at the Wyandotte / Johnson County line is part of KCUR's months-long examination of how geographic borders affect our daily lives in Kansas City. KCUR will go Beyond Our Borders and spark a community conversation through social outreach and innovative journalism. We will share the history of these lines, how the borders affect the current Kansas City experience and what’s being done to bridge or dissolve them. Become a source for KCUR as we investigate Johnson and Wyandotte Counties.